Forty years ago, engineer and physicist Reid Anderson began a success story in a garage in Silicon Valley, California, which is now synonymous worldwide with high-quality storage media. Verbatim enters its anniversary year as the fourth-largest manufacturer in the European storage media market and the world market leader in optical storage media. Today, Verbatim EUMEA is led by Gary Milner, who took over in 2008 from J�rgen Fritz after 20 successful years as the President of Verbatim EUMEA. It all began in 1969, under the Information Terminals Corporation (ITC) company name, with Anderson realising the market potential of computer storage media. For its first product, the small company put tape into bought-in cassette cases, and later developed his own cassettes that featured an extremely stable and precise-running polycarbonate casing. In 1972, ITC had a global share of 90 per cent with this product and employed around 30 people. In 1973, the engineers at ITC further developed IBM�s first 8-inch floppy disk to create a special shell that would protect the disk from dirt and damage. The path to growth continued and in 1976 led to the construction of ITC�s first media factory in which disks were given a unique Teflon coating through an innovative production process. Under the name �Verbatim� � Latin for �literally� � this floppy disk was launched onto the market and was later also available in the 5.25-inch format. Compared to today, these large-format disks stored very little data � in fact, they could only hold a few pages of text! While up to this point, products had only been sold to OEMs, the company now expanded its business to include the retail sector too. The firm already had more than 1,000 staff when it renamed itself �Verbatim�, in recognition of its top-selling product, and was floated on the stock market in 1979. With the launch of the DataLifePlus diskette two years later, the company continued to expand its international reputation as a manufacturer of high-quality storage media. To expand into the Japanese market, Verbatim entered into a joint venture with Mitsubishi Kasei. As the compact, 3.5-inch diskette evolved into a sales hit in the ensuing years, financial requirements for the construction of new production facilities meant that the company had to be sold in 1984 to the photographic and film specialist Eastman Kodak. After five years of collaboration, however, the firms parted company and Mitsubishi Kasei, which had merged in 1990 with Mitsubishi Petrochemical to form the Mitsubishi Chemical Corporation, once again became the company�s owner. Today, the parent company trades under the name of Mitsubishi Kagaku Media. In the 1990s, Verbatim achieved market leadership with floppy disks but the trend was already moving towards magneto-optical storage media in ever-smaller formats and with ever-larger storage capacities � a field in which Verbatim became the front-runner and even today holds the top international position for CD and DVD blanks. Back then, as it is now, Verbatim was one of the few manufacturers to include all the popular formats and products in its portfolio, including many �first to market� and test-winning products. With volumes of data growing on a daily basis, the demand for modern storage media is constantly increasing. Mobile storage solutions, such as external hard drives or USB drives, but also flash cards for use in mobile telephones, PDAs and cameras and camcorders, are especially good sellers in today�s market. Verbatim also recently moved into the innovative flash memory-based solid-state drive business with its SSD ExpressCard. The exceptional sales figures for external hard drives in 2008, after the company moved into this sector in only the middle of 2007, provide affirmation for the company�s strategy. With attractive equipment for the very best in home entertainment, such as the MediaStation Pro, Verbatim is now populating customers� living rooms. New accessories such as loudspeakers, earphones and headphones, mice and mouse pads are just some of the other successful products in Verbatim�s portfolio. 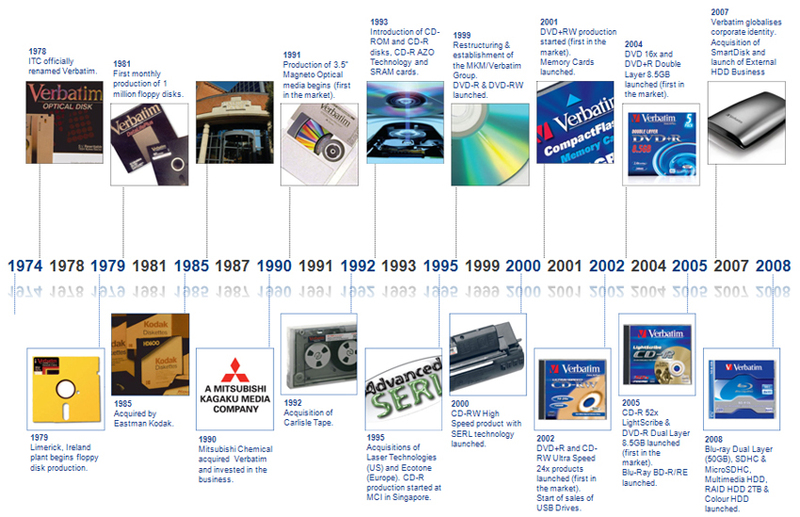 �We look back over the last four decades with pride because we have always been at the forefront of the storage market with our innovations. And this is something we will continue to do in the future; with our 4-pillar product strategy, which comprises optical storage media, external hard drives, flash memory and associated accessories, we are offering a very attractive and broad selection of high-quality products. We are also endeavouring to further expand our market leadership in the field of optical storage media, and are keen to enter the markets of all new storage media and continue to strengthen our product mix,� says Milner.